For the past several years, Georgia Tech been aggressive in punishing students accused of assault and harassment. In August, a black woman complained that members of the Phi Delta Theta fraternity at Georgia Tech had shouted racial slurs at her through a window. The fraternity claimed there was no proof, but it was suspended and required to partake in sensitivity training. An investigation from the Atlantic Journal Constitution found that the school had expelled or suspended “nearly every student” it had investigated for sexual misconduct in the past five years. One state representative thinks this hardline denies the accused due process. Rep. Earl Ehrhart condemned the school’s decision to suspend the fraternity given the small amount of evidence (“These young men have lost an entire half-year of their college experience”) and has since called upon Peterson to resign, citing what he labels as the school’s refusal to give accused perpetrators due process. “We grant that to criminals, why not to students?” he asked in an interview with the AJC. Ehrhart, who is the chair of the House committee that funds the state’s universities, feels that sexual assault cases should be handled by law enforcement, not universities. Well, that’s one backwards interpretation. 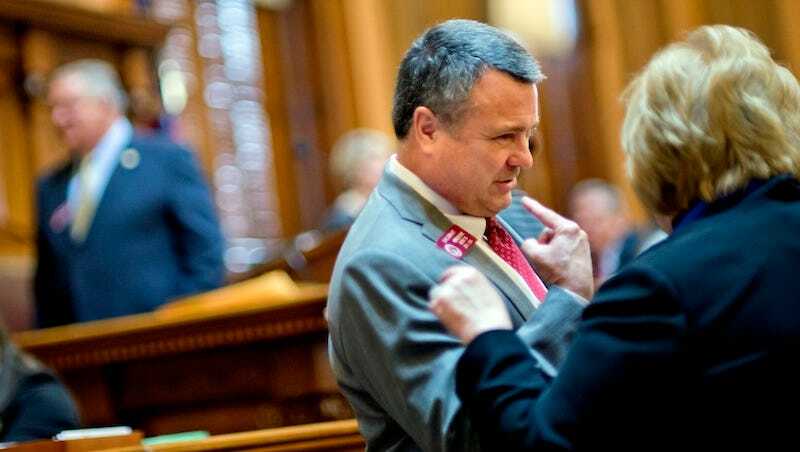 Image of Rep. Earl Ehrhart via AP.